I have been an avid outdoor enthusiast for the past 25 years. I enjoy a variety of outdoor activities including mountaineering, day hikes, multi-day backpacking trips, river and ocean kayaking, backcountry skiing, snowshoeing, mountain biking and rock climbing. I have climbed and hiked throughout British Columbia, the United States and when opportunity presents itself in Europe and India. I carry a wide variety of gear depending on the type and length of trip. I am a Search and Rescue team member in the Canadian Southern Rockies and am part of the swift water, rope rescue technical teams and ground search team. 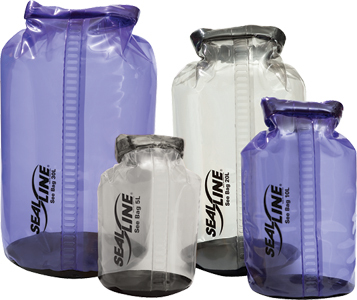 The SealLine dry bags are heavy-duty dry bags which will keep clothes and equipment dry in all weather conditions. The bags are soundly made with high quality materials and rugged enough for years of hard use. I have used these bags for many years while ocean kayaking and have yet to be able to damage one requiring it to be repaired. The SealLine SEE 10 is made of clear 16 oz/yrd2 vinyl sidewalls with a black 19 oz/yrd2 vinyl scrim (polyester mesh) reinforced bottom. The top opening is 8 in (20 cm). The bag is 21 in (53 cm) in height when unsealed and 14 in (36 cm) in height when closed. It uses a Dry Seal roll top closure system with a D-ring attachment point used for lashing the dry bag securely. All seams are heat sealed creating watertight seams. The bag is closed by folding over the top portion of the bag three times. Conveniently located instructions on the roll top clearly indicate the number of times users must fold over the top in order to create a watertight seal. The SealLine SEE dry bags come in 5, 10, 20 & 30 litre models and are available in either clear blue or smoke. I have used the SealLine SEE 10 Dry Bag for many years, mainly during ocean kayaking trips, but also on overnight back packing trips. Trips have included multi-day trips on the West Coast of Vancouver Island, during a 10-day paddling trip through Haida Gwaii and on numerous day and overnight kayaking trips through the Gulf Islands and Desolation Sound, all on the west coast of British Columbia. 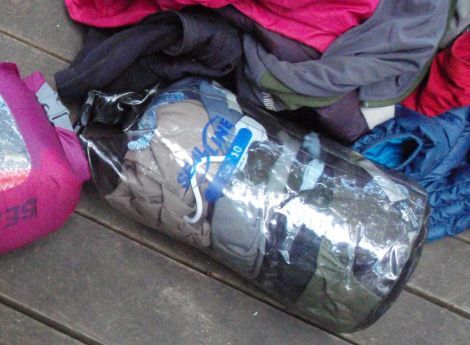 I have periodically used the Dry Bag on Vancouver Island during multi-day backpacking trips. Although most of my trips occurred during the summer the bags have endured everything from light showers to heavy downpours, light snow and frost, too-hot summer days 30 C (86 F) plus. I have used the dry bag to store clothing, food and general gear and periodically as a way to collect and store water during long kayaking trips. The clear vinyl has allowed me to see easily into the bag making it simple to find what I’ve stored in the bag. This has come in very handy especially when I have multiple dry bags to look in to find what I am looking for. The roll top closure is easy to use and ensures a watertight seal when rolled at least three times. I have used more rolls in order to compact the bag down a little more when the bag is not completely filled and the seal remains intact. I have also hung the SEE 10 in trees to store food overnight in the rain and it kept everything nice and dry. I did find that I needed to watch how much gear I put into the bag as I was unable to make the required three rolls to ensure a watertight seal. I found it tempting to overfill the bag on numerous occasions as I could put more gear, food or clothing in it but would not be able to make a good seal. During a couple of trips I did overfill the bag and made only one or two rolls and found that the watertight seal was not as reliable. One roll did not provide a seal at all and two rolls provided a better but not perfect seal. I have used the bag to collect and store water although I would not recommend trying to transport water in a kayak using a dry bag though as even when I made the required three rolls to ensure a tight seal the water eventually made its way out of the bag and into the bottom of my boat. Luckily I had all my gear in dry bags so it stayed nice and dry. With respect to durability I have tossed fully loaded bags on to rocky shores on multiple occasions including on to barnacles with no damage to the dry bag. The only minor complaint that I found with this bag is the vinyl is somewhat sticky and takes a little bit of effort to open after being stored. I also found that as it is watertight it’s also airtight to a certain degree, it will leak air eventually, which can make it challenging to stuff into the small kayaking storage hatches. I have had to reseal the bag, trying to get as much air out of the bag as possible then resealing it, in order to be able to get it through the storage hatch. Although great for keeping gear dry it is quite heavy and cumbersome for backpacking. The SEE 10 provided me with 11 in (28 cm) by 8 in (20 cm) of usable storage space. Although the bag is 21 in (53 cm) in height the first 10 in (25 cm) are used to roll and seal the bag. The total height of the bag is as advertised, 14 in (36 cm), but this includes the roll top which incidentally turns into a great handle and allows for easy carrying of the loaded dry bag or hanging the dry bag in a tree for food storage. Although not a recommended use, the fully sealed dry bag does make reasonable floatation bag. I flipped a canoe heading down the Cowichan River on a day trip and the two dry bags I had in the boat kept the canoe from completely sinking. I was able to retrieve the canoe with gear intact which was still completely dry after its solo run down the river. Overall I would highly recommend this product. It is durable, long lasting and very versatile. Although I have used it on occasion for multi- day backpacking trips it is a little heavy to cart around. For any type of trip where I am on the water, whether heading out on a multi-day ocean kayaking trip or a day trip on the river, I would definitely use my SealLine SEE 10 Dry Bag in order to keep my gear dry.